- Players perform different footskills up to the large cone and back to their start cone - inside and outside, toe taps, soccer boxes, drags. 2. Move onto Attacking Moves. - Large cone is a defender. Players dribble at the same time and perform the attacking move finishing at the opposite end to which they start. Repeat with left and right foot. 4) Beat the defender, accelerate into open space. 1) Aim - use your upper body to defend the ball - can you put your opponents off balance? 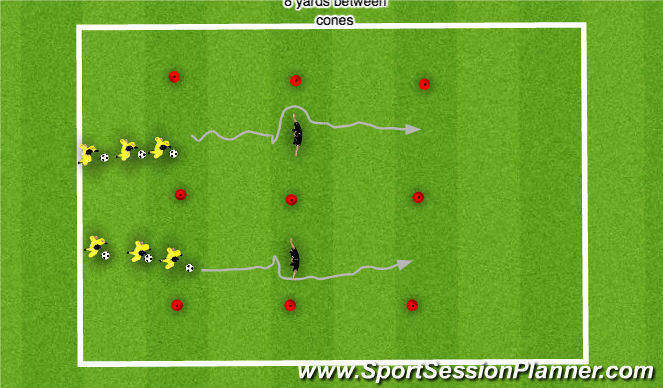 3) Short opposite movements to create a yard of space. - add an additional small field at the side for 3 v 3 (this will be for the subs). - Ensure you are rotating playing positions. 1) Less coaching, let them play.